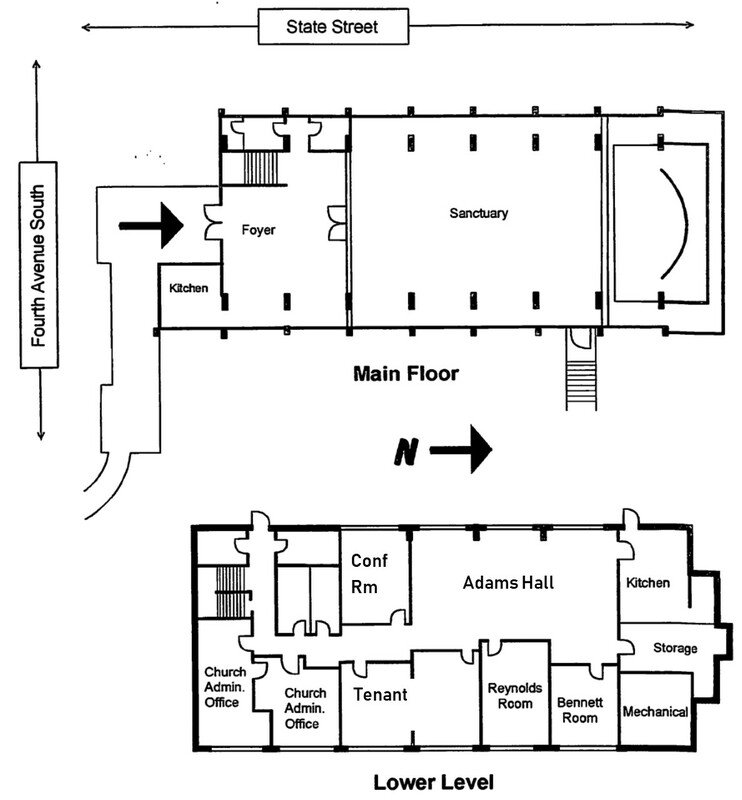 Click for: Interior floor plans. Site plan showing exterior of buildings and parking. Sanctuary and Chapel for Wedding and Reception: $1,400 for up to six hours. $200 each additional hour. Conference Room, Classrooms: $40 for 3 hours / 10 per additional hour. The following décor items can be rented for an additional fee: aisle runner, flower stands, columns, candle holders, candelabra. * Note: Pricing may be higher for weekend events. We offer preferred pricing for nonprofit groups who become regular use renters. Food: Clients may choose a caterer, or may bring in or prepare their own food. Bar facilities: Beer, wine, champagne and cider may be served by clients. No kegs. No hard alcohol. The renter must obtain a permit, and it must be posted at the event. Renter should remove all alcohol containers from the premises rather than using church recycling/trash bins for these containers. Smoking: No smoking is allowed in the building. No cigarette butts can be left outside the entrance. Chairs set up in the same layout as found. A copy of the floor plan will be provided to the renter for reference, and is posted in each room. In the Sanctuary and Chapel, chairs must be interlocked with each other, as required by safety codes. You are responsible for removing decorations and personal items and for folding tables and placing them in designated storage areas. Please also move trash and recycling to outside bins. Renters should check the outside areas, and pick up any paper, cigarette butts, bottles, etc. Wedding specific policies: Wedding rentals include a one hour rehearsal time, to be coordinated in advance, and up to two hours of decorating and set-up time on the day of the event. (If you prefer to set up the day before, there is an additional fee of $100.) Time charges begin when the wedding is scheduled to begin. Grand Piano (in Sanctuary) Available for use for a fee of $100. It must be played by or with the supervision of a professional pianist. Use is granted on a case by case basis. NUUC reserves the right to decline rental to any groups of persons whose statements or actions are in conflict with Unitarian Universalist principles. Please call or text us at 425-495-2373, or email the rental office, to inquire about our space availability and to schedule a personal tour of our facilities in downtown Kirkland.